I have been lucky to only have had one troublesome sleeper out of my three boys. Little J has never been a great sleeper. He’s even been treated for sleep apnea. He also inherited his dad’s ability to pop out of bed like a daisy. It makes moving him while he’s sleeping nearly impossible. I’ve tried lots and lots of ways to try to help him sleep better and in doing so, I’ve discovered a few things. We just spent two weeks traveling. Two weeks of my kids routines and schedules thrown completely out the window. There was one week where my kids were out of the house until after midnight three times! EEK! Bedtimes were thrown to the wind and the hour difference in time zones did little to help. Naps were snatched between errands, play dates and general mayhem – usually in the car. Car sleep is less than restful, in my opinion. It’s a huge understatement to say my kids didn’t sleep enough. 1. To help baby sleep better, use the same bedding you do at home. The Disney Baby crib bedding set was a huge lifesaver this last couple weeks. Even though Baby N slept in a pack and play instead of his crib, I used the same bedding I do at home. It was just enough to help him feel calm and comfortable in his new environment. The first night we arrived, we got there late and I didn’t know where the bedding had been packed in the car (cue panic moment when I was afraid we’d left it at home). We didn’t search for it, as we were exhausted, and Baby N didn’t sleep well that night. I’m sure it was a combination of his schedule being all mixed up, the new environment and an increase in background noise. Once I found the bedding the next day and got it all set up in his pack and play, he was more content and calm, which made getting him to sleep a whole lot easier. He wasn’t as wound up from the beginning and that helped him get to sleep sooner, more easily and sleep better. 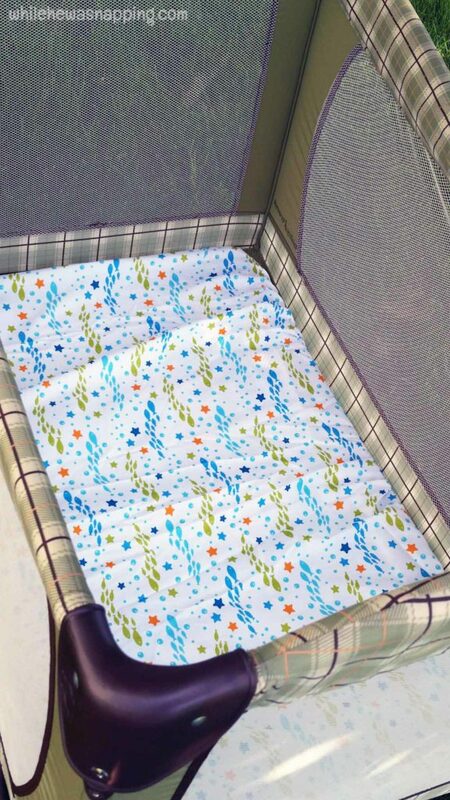 A fitted sheet can be wrapped around the pack and play mat that goes in the bottom. Pull it tightly around the back of the mat as you drop it into place so the sheet fits tightly. Loose bedding in a baby’s bed is a no-no. (I’m sure you’ve heard it before but here’s my disclaimer: loose bedding has been linked to an increased risk of SIDS and should NEVER be used while an infant is sleeping!) Baby N is a pretty calm sleeper, so I just tuck it under as I’m laying the mat down and it stays in place. If you have a wild sleeper, you may want to use a few small safety pins to secure the sheet around the mat better. 2. Cover the pack and play with a fitted sheet for outdoor use. We had a family reunion while we were gone (actually, it was the primary reason we took this little trip) and it involved camping. We were outdoors for about three days straight. Have you ever napped during the day inside a tent? And did I mention the humidity was around 80% each day? Our tent made a nice little sauna and not a great place to try to lay a baby down. 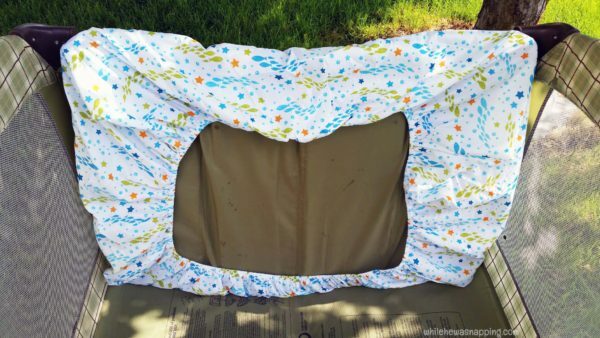 I moved Baby N’s pack and play outside and stretched the fitted sheet of our Disney Baby crib bedding set over the top. It made a much cooler napping spot since the light breeze could still blow through the sides. It also kept the bugs off Baby N. My sister-in-law used it with two-month old and I think she’ll be packing a fitted crib sheet next time they go on vacation! 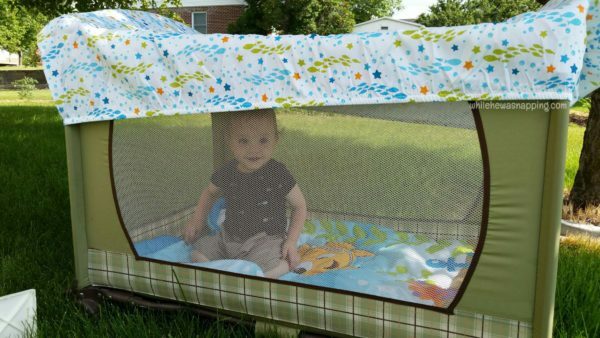 Letting Baby N nap outside definitely helped him sleep better than he did in the tent. Despite the increased distractions, the kid slept like a rock. That’s the wake up face of a good nap! This is super simple. You just stretch the sheet over the top of the pack and play and secure the corners of the sheet with the plastic corners of the pack and play. Try to get the sheet as taut on the top as you can. You don’t really want a bunch of loose fabric hanging into the pack and play and over your baby. It’s probably not long enough to entangle your baby, but better safe than sorry. Kids can do some crazy acrobatics, even while they are sleeping. If you end up with a lot of loose fabric draped over the sides, roll it under the elastic on the sheet to help keep the excess out of the pack and play. Use a comforter at the beach, the park, the lake, or anywhere you need a ground blanket. 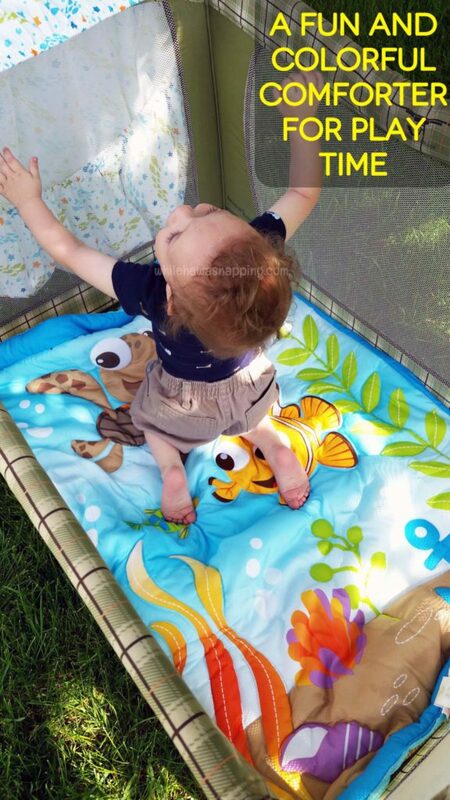 I used the comforter in the backyard while we were outside one afternoon and my older kids were playing in the pool. I actually used it both in the grass and in the bottom of the pack and play. Baby N was not asleep when the comforter was in the bottom of the pack and play. Putting him in the pack and play was a nice way to keep him out of the pool while the bigger boys played. He loved that it was his space and his blanket was in there with him too. And he thought the pool water was too cold anyway and was more content to sit and play in there than I expected. When the comforter was on the ground it was a safe haven from that awful poky grass. 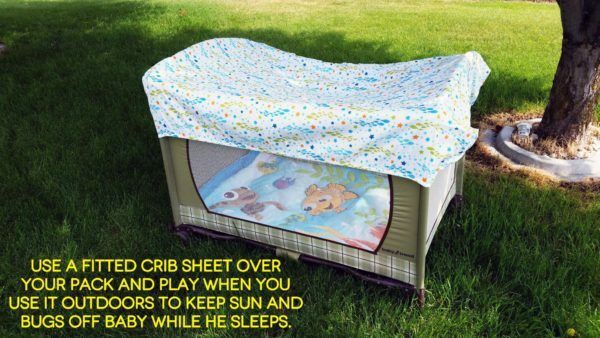 Want to try taking your own set of crib bedding on your next vacation? 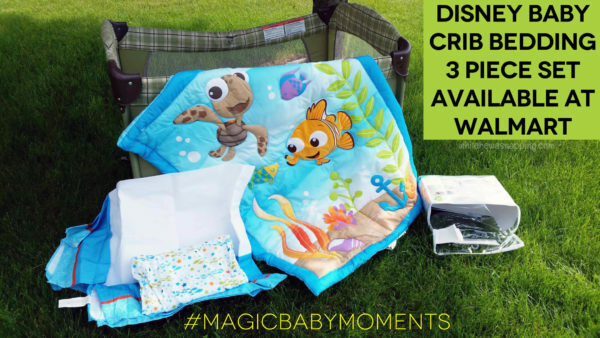 Disney Baby has some adorable collections and they are super easy to care for. I love the bag it comes in, which makes packing it up incredibly easy. We have the Nemo set, which I picked up at my local Walmart, and Baby N loves it. The textures and colors on the comforter are engaging and the sheet is comfortable on his skin. The Disney Baby sets also include a dust ruffle for your crib back home. 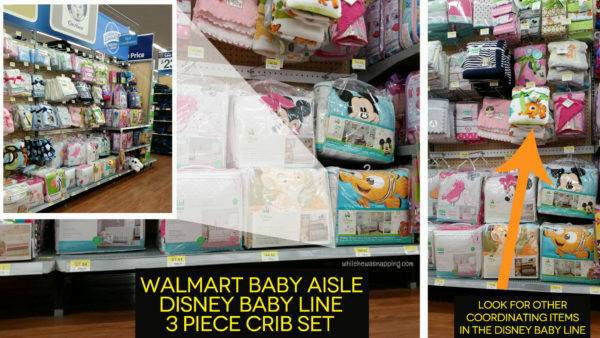 Check out the entire Disney Baby line at Walmart! Which is your favorite collection?